The medical world has recognized five different classifications of pulmonary hypertension which, we’re sure, makes the diagnosis pretty confusing for patients. You may have a friend who’s also been diagnosed with pulmonary hypertension but who has completely different symptoms than you do, even though the conditions sound the same. That’s why we've prepared this list to help educate patients on what makes each group different, from both a diagnosis and treatment perspective. Pulmonary hypertension (PH) in itself is a general term that describes high blood pressure within the lungs, which also impacts the arteries that transport the blood between your lungs and heart. In general, if you have pulmonary hypertension the arteries constrict and force your system to work harder for the blood to flow through the vessels. Although the condition itself is straightforward, there are several different things that can cause heightened blood pressure within the lungs. Because of this, there’s a need for subclassifications (i.e. 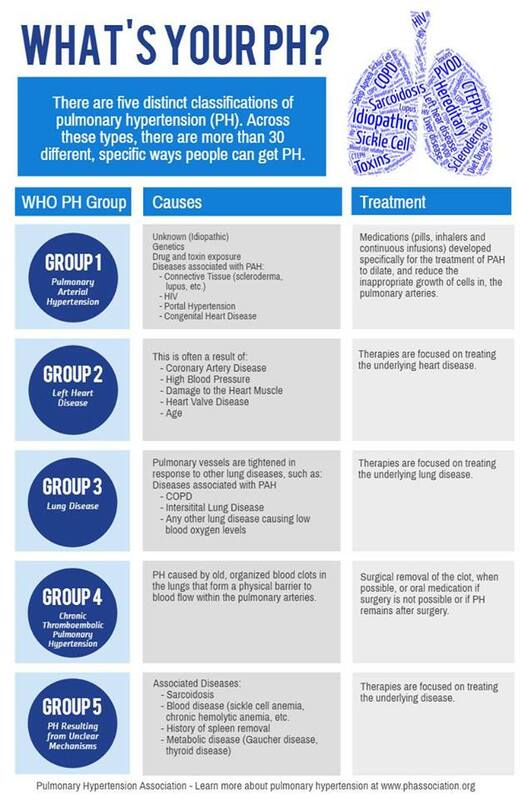 “groups”) of pulmonary hypertension, each one of which differs slightly from the others. Knowing that, let’s dive more into what pulmonary hypertension is and the specifics of the different pulmonary hypertension groups. Pulmonary arterial hypertension is a chronic disease that makes the artery walls of the lungs thicken and, as a result, prevents the blood from circulating properly. There are three types of pulmonary arterial hypertension based on the origin of the cause: idiopathic, heritable, and drug and toxin-induced. Idiopathic pulmonary arterial hypertension is a type that has no known cause. The disease is more commonly diagnosed in females and young adults. Next, heritable is a form of PAH that can be passed from parents to children and is considered a genetically-related form of pulmonary arterial hypertension. Finally, the drug and toxin-induced type speaks for itself: the disease can be caused by drug and toxin abuse or as the result of another evolving disease like HIV, lupus, congenital heart disease, chronic liver disease, and more. Treatment options: Common treatments for PAH include medications that assist the pumping of the heart, help decrease blood pressure and prevent blood vessels from narrowing, get rid of extra fluid that puts pressure on the heart, and reduce undesirable cell growth within the pulmonary arteries. This type of pulmonary hypertension is characterized by problems with the left side of the heart and can be caused by numerous heart disorders like left ventricular diastolic dysfunction, coronary artery disease, high blood pressure, heart valve disease, damage to heart muscle, and more. Treatment options: For this group of pulmonary hypertension the treatment will be focused on approaching the disease that caused hypertension in the first place. In addition, to achieve the necessary flow, a gradual pulmonary arteries’ pressure elevation might be required. Patients falling under this group will have pulmonary hypertension developed as a secondary disease after suffering from hypoxia, COPD, interstitial lung disease, or any other lung disease which causes blood vessels to tighten and blood oxygen to drop. Treatment options: Similar to the previous group, pulmonary hypertension due to lung diseases and/or hypoxemia treatment will be targeted towards the underlying lung disease. This type of pulmonary hypertension would be caused by old, organized blood clots in the lungs that physically block the flow of the blood through the pulmonary arteries. Treatment options: The treatment for this group would include a surgical removal of the blood clots. If surgery is not possible, a pulmonologist will choose medications which stimulate certain chemicals in your body to work together and influence the blood flow. Group 5 combines all other causes that are not defined in the previous groups. For example, all causes like hematological and metabolic disorders, various blood diseases, and system disorders will fall under this group. Treatment options: The treatment will solely depend on the underlying reason. Thus, if a patient has a metabolic disorder that has lead to pulmonary hypertension, his treatment will be mainly aimed at the metabolic disorder as well as relieving pulmonary hypertension by additional medications. How To Prevent Pulmonary Hypertension? It might take months or years before pulmonary hypertension symptoms start bothering you. It’s always better to prevent the disease if possible, rather than deal with dangerous consequences later. With that being said, try to follow simple prevention tips like no smoking, getting lots of sleep every night, managing blood pressure, exercising regularly and maintaining a healthy weight. If you are already experiencing any of the aforementioned symptoms, don't hesitate to reach out to Pulmonary Associates of Brandon with any questions or concerns. Our highly experienced pulmonologists will perform a range of diagnostic tests to determine the origins of your symptoms. To see a pulmonologist, book an appointment today.